We saw esters can be handled quite easily in acid environment. It is indeed simple to turn one ester to another (transesterification) with an acid catalyst , or else have an acid-hydrolysis which gives back the constituents of the ester (carboxylic acid and alcohol). While as soon as we get to a basic environment things change . When an ester face a strong base such as an hydroxyde , we're not going to get the products we would expect from an hydrolysis reaction. The tetrahedral intermediate will then collapse to give again a carbonyl and the choice is between two leaving groups: the hydroxyl ion, OH- or the alkoxyde (isopropoxyde in the present example). The alkoxyde (RO-) and hydroxyl (OH-) ions are leaving groups who differs very slightly. This means that this two groups have more or less equally likely to be lost. If the hydroxyl is lost from the intermediate we're just getting back to the starting molecule. 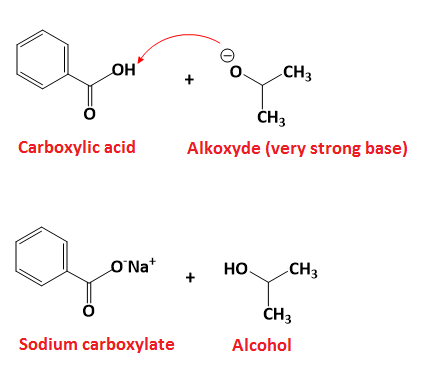 What is more interesting and what actually the overall direction of the generale reaction is the loss of the alkoxyde ion, as shown in the image above. As you surely can see the reaction proceeds as a really simple acid-base reaction! Considered the product of the addition-elimination mechanism are an acid (carboxylic acid) and a base (isopropoxide, by the way very strong) the most logical development of the reaction is the exchange of a single proton from the acid to the base. The reaction is irreversible because we just got a carboxylate (salt of a carboxylic acid), a very unreactive species, especially towards nucleophiles, and that is what moves the general reaction to the right, to the products. Actually the molecule we took for this specific example is exceptionally stable given the conjugation at the same time with the arylic system. Esters base-promoted hydrolysis can therefore be rather usefull to distill alcohols constituents ( in the present example isopropilic alcohol).